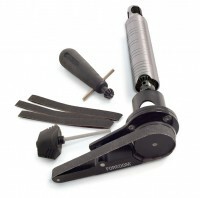 Foredom’s New Angle Grinder attachment is designed for use with our most popular H.30 Chuck-Style Handpiece. This quality-machined, sturdy, and compact device works with 2″ and smaller discs and 2″ wheels with 3/8″ arbor holes. 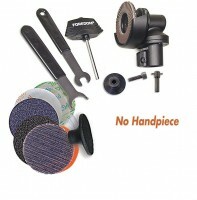 We offer 100+ accessories for this versatile product that can be used to grind, sand, and polish on various types of materials including metal, wood, stone, glass, ceramics, bondo and more. Use in Forward Rotation ONLY. 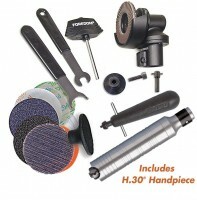 Foredom’s popular H.30® Chuck Style Handpiece comes with HPCK-0 CHuck Key in molded plastic handle.